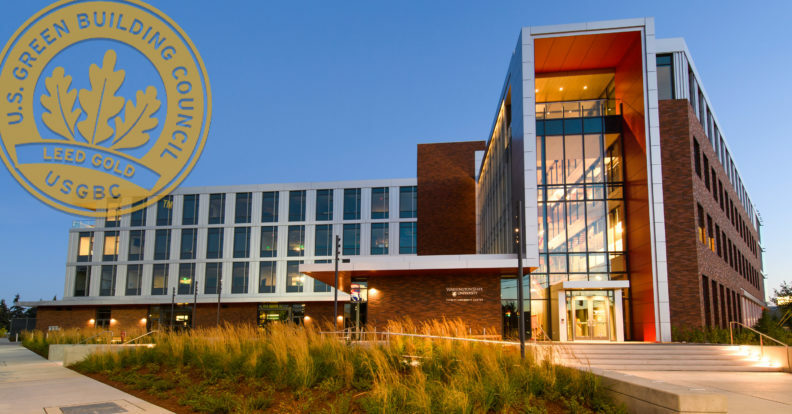 EVERETT, Wash. – July 11, 2018 – At Engage Everett on Wednesday evening, Washington State University (WSU) Everett announced that the institution’s building at 915 North Broadway has been certified LEED Gold by the U.S. Green Building Council for the sustainability features in construction and operation. Sustainability is a core value of Washington State University and was a priority for legislators when state funds were authorized for construction of the campus building. WSU Everett is a 95,000 square foot building with engineering laboratories, general and active-learning classrooms, computer laboratories, a tiered lecture hall, a math and writing center, faculty and administrative offices, and a variety of study spaces for students. Design and construction cost nearly $65 million. Ground was broken in Sept. 2015 and classes started in late August 2017. The building uses photovoltaic arrays, natural ventilation, natural lighting, rainwater harvesting, radiant flooring, rain gardens and advanced LED fixtures. According to the U.S. Green Building Council, WSU Everett is one of six LEED Gold buildings in Everett, Wash.
A team of WSU Everett engineering and communication students used the building for a student research project, determining that the building was meeting sustainability operating standards set by the design-build team. They presented their results to that team in Seattle and to legislators in Olympia, earning a Senate Resolution honoring their work. 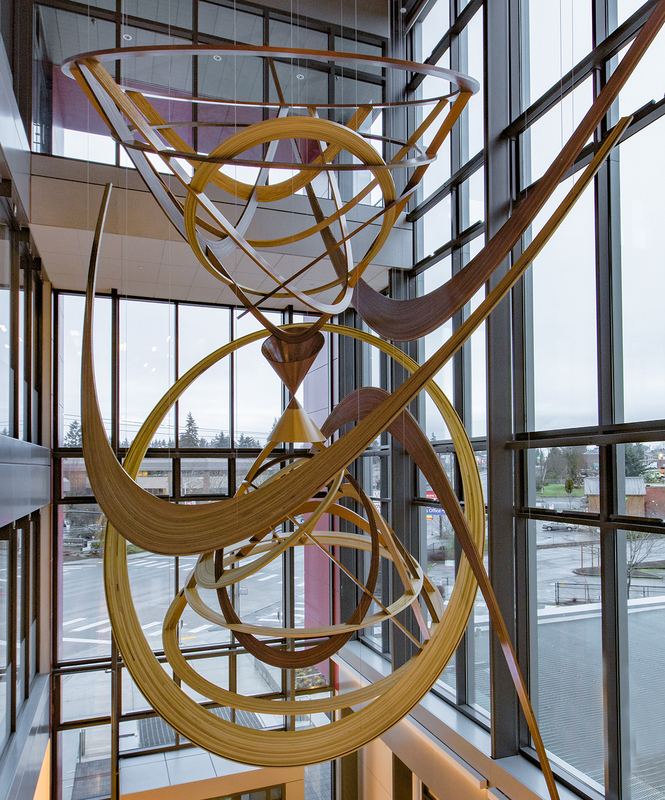 The event also featured the official public welcoming of Paul Vexler’s Conic Sections sculpture. 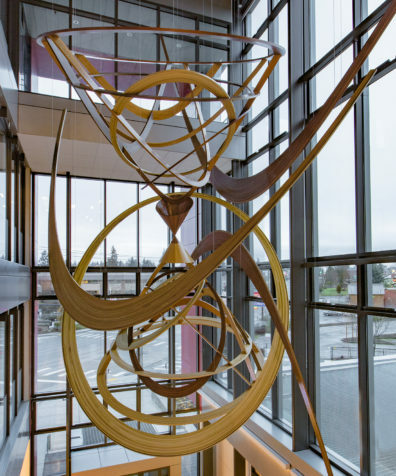 Conic Sections is made of wood and steel, and was commissioned by the Washington State Arts Commission in partnership with the Washington State University State Art Collection. It celebrates the beauty of the curves that are created when a cone is intersected by a plane. The circle, ellipse, parabola and hyperbola are shapes that have been admired for thousands of years. They are also essential in understanding the motion of objects here on earth and in our solar system. Washington State University Everett is student- and community-centered, bringing industry-aligned undergraduate programs with an interdisciplinary focus to the North Puget Sound region. The campus brings WSU’s world-class academics to Everett in small class sizes with hands-on opportunities. WSU currently offers seven high-demand bachelor’s degrees, including software, mechanical and electrical engineering, data analytics, strategic communication, hospitality business management and organic and sustainable agriculture. The building also houses the Everett University Center, with undergraduate and graduate degree programs from Western Washington University, UW Bothell, Eastern Washington University and Hope International University.